45+ MPG! 2015 VW Golf TDI SEL Premium * Only 15,300 Orig. 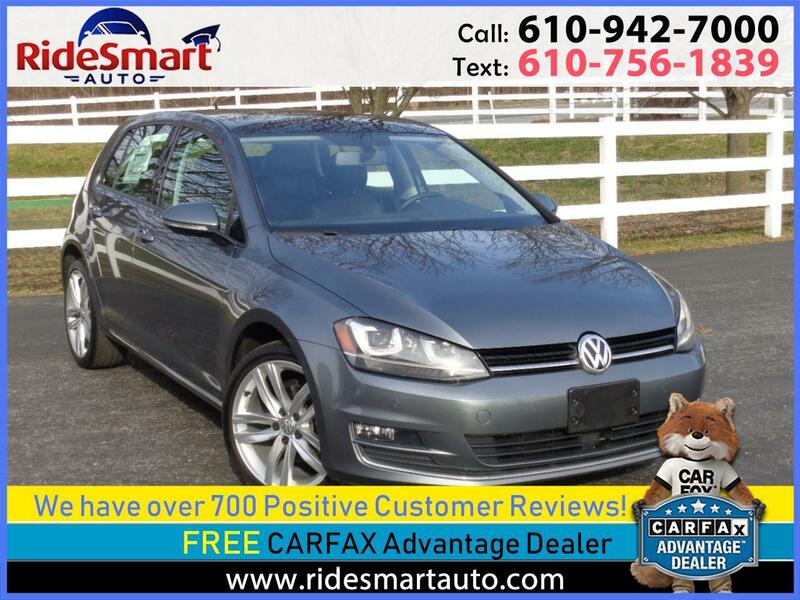 Miles 1 Owner * Garage Kept * Carfax Certified (Accident Free) Spotless Condition * Massive Remaining VW TDI Transferable Warranty/ Incredible Mpg/Extremely Durable/Long Lasting Car! NAVIGATION * PREMIUM WHEELS * FENDER PREMIUM SOUND SYSTEM * MOON ROOF * AUTO TRANS * LEATHER HEATED SEATS * POWER WINDOWS-POWER LOCKS-TILT/TELESCOPIC STEERING WHEEL- CRUISE CONTROL-DUAL POWER HEATED SEATS A/C AM/FM/CD AUX PORT- BACKUP CAMERA- ALUMINUM RIMS... BEST VW WARRANTY EVER...EXTENDED TDI WARRANTY UNTIL 2026 OR UP TO 162,000. MILES! SMARTEST PRE-OWNED CAR VALUE! LIKE NEW CONDITION!! Brand New PA Safety Inspection Performed on This Vehicle with Thorough Reconditioning consisting of All New Brake Pads & Rotors with Lifetime Parts Warranty, New Oil Service, New Wiper Blades, Repair any significant Door Dings,Complete Interior & Exterior Detailing.Two(2) Master Keys, Books & Floor Mats.